Le délai de disponibilité est estimé à 1 à 3 jours ouvrables. The GNS 530 and its slightly smaller sibling, GNS 430, lead the industry with multitasking, integrated avionics. The standard GNS 530 features a 10-watt comm, and for a slightly higher price, GNS 530A delivers 16 watts of power output. Both versions come with optional WAAS navigation and/or Class B TAWS alerting to warn you of potential terrain and obstacle conflicts along your flight path. 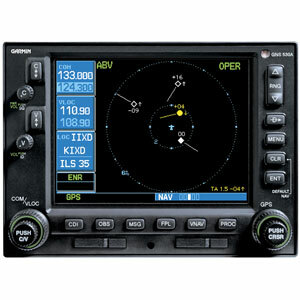 GNS 530 is an all-in-one GPS/Nav/Comm solution. It features a TSO-certified GPS, 2280-channel capacity comm and 200-channel ILS/VOR with localizer and glideslope. Traditionally it would take a host of components to provide the capabilities of this one smart box. High-speed 5 Hz processing makes navigation calculations and map redraw rates five times faster than earlier GNS series navigators. 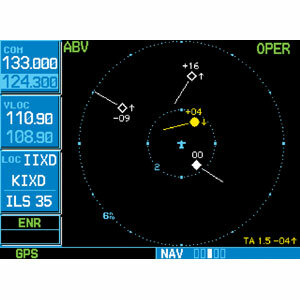 GNS 530's 5-inch high-contrast display with brilliant colors makes it easy to read and interpret pilot-critical information. Effective use of color makes it easy to see your position relative to ground features, chart data, navaids, flight plan routings, approach procedures and more. Conveniently scan information from wide viewing angles, even in direct sunlight. GNS 530 seamlessly integrates built-in terrain and navigation databases, providing a clear, concise picture of where you are and where you’re heading. The 530's huge Jeppesen® database, updated with front-loading data cards, contains location reference for all airports, VORs, NDBs, Intersections, Flight Service Stations, published approaches, SIDs/STARs, Special Use Airspace and geopolitical boundaries. A detailed basemap shows airports, cities, highways, railroads, rivers, lakes, coastlines and more. Using information from the built-in terrain and U.S. obstacles databases, the 530 displays color coding to graphically alert you when proximity conflicts loom ahead. In addition, you can augment GNS 530 with WAAS navigation and/or optional Class-B Terrain Awareness and Warning System (TAWS) for an extra margin of safety in the air. Working in tandem with standard autopilots that accept roll-steering commands, GNS 530 behaves like a high-end flight management system (FMS) and can automatically fly your aircraft through holding patterns, procedure turns and other position-critical IFR flight procedures. GNS 530 is easy to interface with a wide array of optional sensors and tracking systems, allowing you to see and avoid hazards such as threatening weather, lightning or air traffic. With an optional subscription to XM WX Satellite Weather™ and the addition of the GDL 69 or 69A datalink receiver, you’ll have access to high resolution weather for the U.S., right in the cockpit. 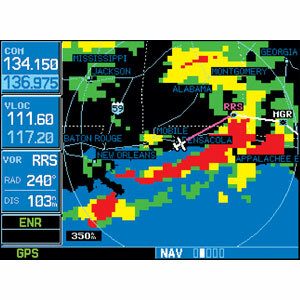 Information includes NEXRAD and METARs and can be laid directly over Jeppesen and topographic map databases. With an additional monthly service fee, GDL 69A delivers XM Satellite Radio to your aircraft. 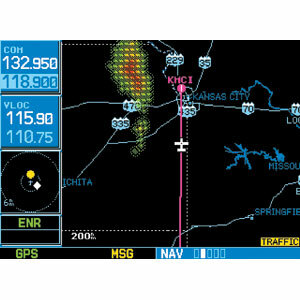 Add the Garmin GTX 330 Mode S transponder, and GNS 530 will also display Traffic Information Services (TIS) alerts that identify surrounding air traffic.